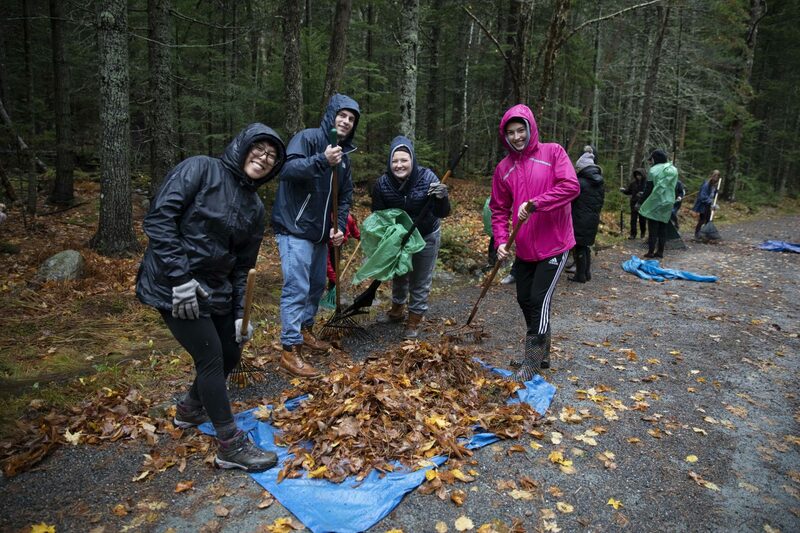 ACADIA NAT’L PARK — Despite drenching rain, an inspirational 300 volunteers show their pride in the park at the annual Take Pride in Acadia Day on Saturday, Nov. 3. Together, volunteers raked fallen leaves from drainage areas on nine miles of carriage roads in 18 locations. Now in its 28th year, the event is sponsored by Friends of Acadia and facilitated by Acadia National Park to support maintenance of the historic carriage roads. More than half of the volunteers are young people from schools including the University of Maine, Husson College, and Boy and Girls Scout groups. Community groups included the Downeast Outing Club, Footloose Friends, LL Bean, Schoodic Institute, and Sea & Mountain Hiking Club. In addition to the groups, over 36 individuals from all over New England participated in the soggy, yet festive day. Following the morning’s work, a hot meal of chili, cornbread, cake, and cider was served—the day’s traditional “CCC + C” lunch, recalling the Civilian Conservation Corps members who did so much work in Acadia during the 1930s. Take Pride in Acadia would not be possible without support from the community. “We would like to thank this year’s sponsors,” Steele said. They include: Bar Harbor Bank & Trust, Bar Harbor Savings and Loan, The Bluenose Inn, Burdick & Associates Landscape Design, Dawnland, Evergreen Home and Hearth, Fiore Artisan Olive Oils & Vinegars, The First, Gallery at Somes Sound, Galyn’s, John Williams Boat Company, Knowles Company, Lynam Agencies, Machias Savings Bank, MDI Hospital, Pedego Acadia, and Window Panes. In addition, transportation for volunteer groups were generously donated by Acadia National Park Tours, Coastal Kayaking, Downeast Transportation/Island Explorer, and National Park Sea Kayak. Friends of Acadia and Acadia National Park are very grateful to all who made Take Pride in Acadia Day a huge success.